The sooner we can replace missing teeth, the better off you will be. 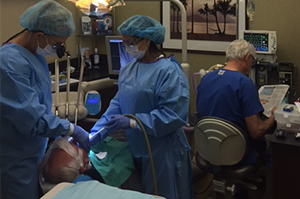 Our dentists offer comprehensive implant dentistry services at Oceanside Dental Excellence. Dental implants look and feel natural and they allow you to regain full smile functionality. We are pleased to say we offer the complete implant dentistry experience here. We diagnose, place the tooth implant, and create the custom replacement tooth. A tooth implant is a permanent tooth root replacement. It is a medical-grade titanium rod that is placed into the jawbone. The tooth implant fuses with the bone and performs the functions of a real tooth root, keeping the teeth and jawbone healthy. Implant dentistry can save your smile and your health. If you need a tooth replacement, consider dental implants. To learn more about our innovative tooth replacement options, contact Oceanside Dental Excellence today via text, call, or email. We help patients throughout Oceanside, Fallbrook, and Vista CA replace missing or damaged teeth.